Toys can do more than entertain. Priscila Caçola, assistant professor of kinesiology in the UT Arlington College of Nursing and Health Innovation, has published research showing how specific toys and items in the home can help children develop motor skills. When it comes to a baby’s development, which toy you buy might matter less than where you put it. Priscila Caçola, assistant professor of kinesiology in the UT Arlington College of Nursing and Health Innovation, has published research showing how specific toys and items in the home can help children develop motor skills. Hear that? Toys on the floor are approved! UT Arlington kinesiology professor, Priscila Caçola published research in the journal Physical Therapy on how different types of toys affect an infant’s motor skills, as well as how to best arrange the house for a baby to play in. She says if you think about it, the home is a baby’s playground, and whether there’s space to move and walk is crucial for development. In addition to some simple rearranging of furniture – say putting a gap between the coffee table and the couch so babies have to learn to crawl, Caçola says you can encourage babies to move with toys. 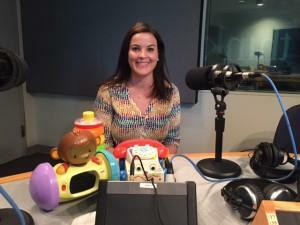 She brought in three examples of toys for different age groups that she likes. The first toy, called the SnugaMonkey, is for three-to thirty-six month olds. Caçola says the small musical toy with wheels its good for babies who are still on “tummy time” — there’s a mirror and monkey to stare at, as well as for kids learning to crawl. The second toy is an $8.00 stacking toy – a basic ring toss for babies at least 6 months old. This one, Caçola says, allows kids to learn to use different grips. It also encourages bimanual coordination— using both hands at the same time. “For us it’s very easy to do this, but for a little baby their brain is figuring out how to transfer information from one side to the other,” Caçola says. The third toy is a classic, introduced back in 1962 as the Chatter Phone, it was originally designed to teach kids how to make a phone call. Nowadays, babies are primarily learning how to swipe with smart phones. Actually spinning the rotary, Caçola says, helps infants develop finger dexterity. And, it teaches them a little lesson about how difficult it used to be to make a phone call. The medical journal Pediatrics recently published study results on a new tool developed to help doctors identify children under two with abusive head trauma. Some call it shaken baby syndrome. Dr. Glenn Hardesty has witnessed such cases as an emergency room physician at Texas Health Arlington Memorial. He explained the medical and legal reasons for the new tool. For years, Los Angeles Times columnist Meghan Daum wanted to write about her choice to not have children. No editors would take her pitches, she says, even as attitudes toward sexuality and marriage became more progressive in the mainstream. More than six million women have trouble getting pregnant. At 1 p.m. on Think, reproductive experts Dr. Satin Patel and Dr. Bruce Carr will talk to Krys Boyd about the options available to couples facing infertility. In 1981, before maternity blogs with snappy names like “Pregnant Chicken,” a young mom-to-be wrote a column for her local newspaper. Reporter Mary Alice Collins loved crafting stories about Lamaze class, uninvited parenting advice and that magical day when baby made her way into the world. Thirty-two years later, our own Courtney Collins pores over her mom’s articles, looking for guidance and compassion as she prepares to welcome her first child in March.